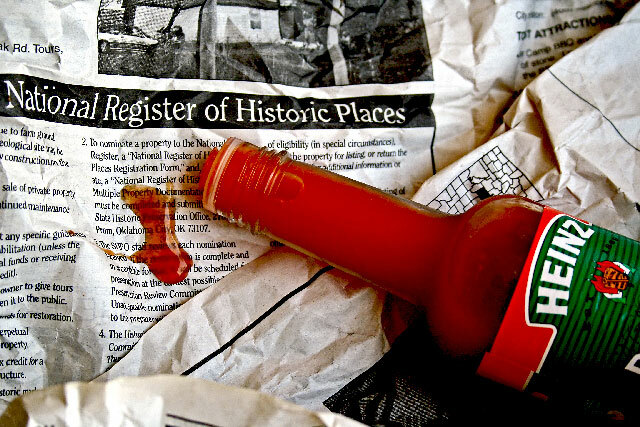 Good for a Heinz commercial, and I love hot sauce. But the idea needs just a bit more to tie into the assignment, like chicken wing bones on the paper -- yes, that would really make it! Interesting closeup. Good use of color. I'm wondering if this is a statement of some kind? Or is it just garbage? Provocative. Love the way the red pops on the B&W paper. Who threw out almost full bottle :) ? clever idea! like the composition a lot. like the colors as well as the lighting. nice job! Very nice, it seems that you have an eye for hot stuff! Way too much sharpening, but funny idea. A nice splash of colour. There just seem to be a few jaggies along the neck of the bottle, perhaps from the downsizing method. Proudly hosted by Sargasso Networks. Current Server Time: 04/20/2019 02:24:36 PM EDT.